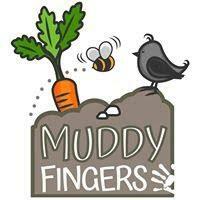 Have a bit of free time and fancy doing something a bit different with your toddler – try Muddy Fingers! 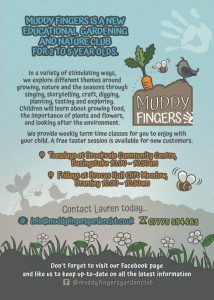 Muddy Fingers truly is a one of a kind class in Basingstoke. I have been to a lot of toddler classes in the local area and I have never been to one like this. If your kids love gardening and learning about nature, food and the environment then this could be for you. 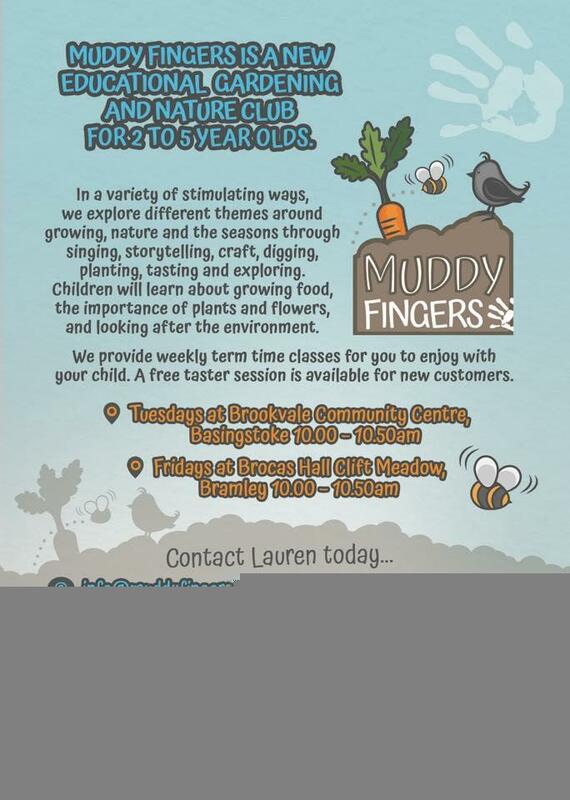 Lauren, who started Muddy Fingers in September 2018, is a keen gardener and has two young children of her own. Her enthusiasm for the subject is obvious and so far, we have covered some great topics ranging from berries, sunflowers to hedgehogs. 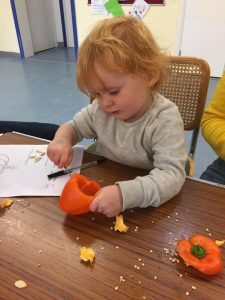 Each session is based on a new area and every week your child gets something to take something home with them, be that a craft or a seed that they have planted in their own pots. We particularly enjoyed the pumpkin class that was held around Halloween. Each session starts with a talk about the topic so at this class we got to touch and feel lots had of different pumpkins. 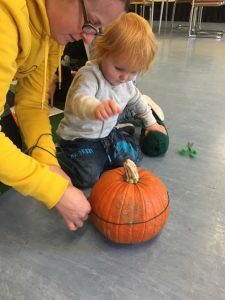 The children were encouraged to describe how then pumpkins felt – were they bumpy, smooth, squashy? Lauren then told us about how pumpkins are grown and the differences between each of them. I was particularly surprised that a pumpkin is technically a fruit as its seeds are grown on the inside. Each child then picked a pumpkin and using a fact sheet they measured how big it was, how heavy it was and how tall it was. The children then picked one pumpkin for Lauren to slice open. This allowed them to all look at the inside and enjoy the messy job of scooping out the flesh and seeds! This was another opportunity to discuss how the pumpkin felt inside as it was pretty squashy and slimy! After a lot of messy fun, we moved onto some tasting as Lauren had brought in some homemade pumpkin soup and roasted pumpkin seeds for everyone to try. The seeds were particularly popular! Our last activity involved orange peppers which the children carved like Halloween pumpkins. My son ate his 5 minutes after finishing it! The class concluded with a lovely pumpkin themed story which was read by Lauren. Don’t wear your best clothes to this class, your children will get dirty! There is not food or drink offered at these classed but occasionally food will form part of the class. For example, we have made smoothies from popular berries which the children drank one week. If your child has allergies it would be worth telling Lauren about them when you register for the class, then she can accommodate for them. Currently sessions are held in two community centres – Brocas Hall at Clift Meadow in Bramley and Brookvale Village Hall, Basingstoke. Both halls have a toilets and disabled toilets with changing facilities. Both halls have good parking facilities. The car park at Brookvale is closed as soon as the class has concluded. Brookvale Village Hall is an easy 10 min walk from Basingstoke town centre. £40 for 5 weeks block of classes, and every week your child gets to take home something. Tuesdays at Brookvale Village Hall, Basingstoke at 10am-10.50am. Fridays at Brocas Hall at Clift Meadow, Bramley at 10am-10.50am. 5 out of 5. It may be a pricey class but it’s great to do something so different with your children. They truly love getting their hands dirty when they have done planting. We have made our own runner bean mini greenhouse one week! The best bit is that this class helps you and your children learn about the world around them. Kids are encouraged to try new foods and get outdoors in the garden. My son and I are really looking forward to attending the summer classes when we will see the results of our winter planting and then we can start growing some fruit and veg for next summer! Roll of 2019!